If you’ve visited the historic house Triangle Land Conservancy calls home, you may have noticed the Upstairs Downstairs motif we have cultivated. Downstairs you’ll find staff who make sure the bills are paid, the stories are told, the big picture taken, and memberships are renewed (is yours up to date?). Downstairs supports upstairs work. Upstairs, you’ll find the conservation and stewardship teams putting together land deals, designing trails, and laying plans for how we will use land conservation as a tool for local farms, wildlife habitat, drinking water, and connecting people with nature. Neither level can exist without the other, and the more we collaborate the more land we conserve for you. Since December 2015 I have been downstairs fostering collaborations and developing programs to increase support as the Community Engagement Manager. My next move will take me upstairs to a new role as Conservation Manager starting in October. This spring TLC’s s taff and board updated our strategic plan to inform our work through 2025. With increasing urgency and excitement, we analyzed the implications the region’s unprecedented population growth and demographic changes have on our clean water and open space. Inspired by the increased support of conservation from people like you and hundreds of new donors and supporters, we decided we had to accelerate the pace of conservation. Specifically, we plan protect 25,000 acres by 2025 – doubling the pace of conservation over the last six years. The TLC board’s approval of the 2025 Strategic Action Plan included recognition that we need more staff to make this happen. As the Conservation Manager I will focus on catching up on existing conservation initiatives, closing land deals, and building our networks to prepare to meet new challenges with creative solutions. Luckily for me, this is work that not only excites me but is well suited to my background and experience. Before I moved to Durham, I managed a nonprofit environmental law firm in South Carolina. There, I spent much of my time interpreting legalese for our stakeholders, following strict protocols dictated by the courts, and researching the past ambiguities and policy loopholes that led to current environmental catastrophe. This was especially troubling to observe right after finishing my Master’s degree in Environmental Policy from the Middlebury Institute for International Studies at Monterey where I learned about economic solutions for environmental problems and policies that could work for people and the environment. Land conservation is a powerful tool and I am eager to apply what I’ve learned to conserving the lands I have come to love and effecting positive change in my community in perpetuity. 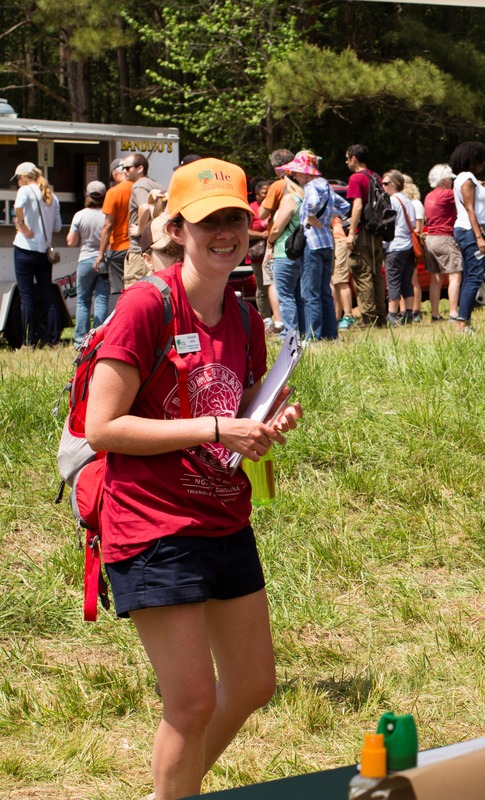 As the Community Engagement Manager my job has been to foster collaborations and create fun ways for the Triangle community to learn about and interact with your local land trust. Each year we host more than 60 events designed to get more people excited about land conservation. Perhaps no one has benefitted more from my efforts, than me! By telling the story of TLC’s work over and over, exploring wild and working lands up close, and hearing what land for tomorrow means to you, I am more convinced than ever that land conservation is the key to the Triangle being a healthy and vibrant place to live. Getting outside with all of you and exploring the best parts of the Piedmont has been a wonderful introduction to the Triangle and a chance for me to grow alongside TLC. Now, please help TLC find our next Community Engagement Associate to help carry the enthusiasm and energy we have for wild and working lands to every corner of the Triangle. Meanwhile, if you need me, I’ll be upstairs.